Growing up in America, you always hear of American classics like apple pie, hot dogs and Chevrolet, but I never really thought of America as having a culture. It is such a mix of people from different backgrounds, with different cultures that it has created its own culture without me even realizing it. My first crash course in American culture really came when I moved to Scotland. Learning to do things differently, say things differently, spell things differently and eat different foods...I realized I had been raised a certain way, and that was the American way. Then talking to people over here and realizing that most people think life is like what they see in the movies. They think most Americans are gun toting, Christmas caroling, car driving, big portion eating, obese people. But, there is so much more to America than that. 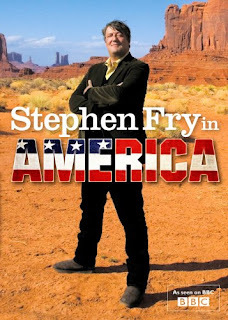 Ian and I started watching a BBC series, Steven Fry in America, where this British guy drives a black cab (common taxis over here) through all 50 states. Many of the things he does along the way are interesting, and some quite random. But, things other people find odd, make me feel nostalgic and miss the place I call home. It's things like Friday night football games, Thanksgiving, Abraham Lincoln, immigration, hot dogs and more that I see on this show that make me miss my home. It makes me realize that America really does have a culture. Living there, I never really thought we did. But not living there, I realize how much we truly do. GO AMERICAN CULTURE! You get to come and visit soon and I'm excited!